I’ve been keeping pretty quiet this last week. I’ve been trying to put one foot in front of the other. I’ve been trying to stay in my happy place. I’ve been trying to work my way through this crazy process while staying authentic and present. I saw my hubby get down that I wasn’t responding terribly well in this IVF 1.1 cycle. I feared that any day when I went for a monitoring appointment I was going to leave with yet another cancelled cycle. BUT I’m glad to say that my amazing RE and his team didn’t give up on me! I stimmed for 10 days in total prior to my HCG trigger on Saturday night. I was working with just four follicles of notable size, but given the diagnosis of DOR last cycle my clinic wondered if that’s just as good a result as I was going to get and were ok to push forward with my protocol and see how we pan out. So on Labour Day Monday I went in for my Egg Retrieval with my heart in my mouth and beyond anxious about what we might find. The process itself was fairly uncomfortable. I’ve got crazy floating ovaries which tend to wander about. This means it takes A LOT of abdominal pushing and pressure to get them into a place they can be viewed. OUCH! I was given a fairly funky cocktail of drugs and that meant I cared not a jot! So – four follicles = four eggs !!! Woohoo! Relief! We were delighted and I got to see my REs happy face! I slept for 20hrs that day and woke up on Tuesday feeling GREAT! My Dr had spoken to me on Monday and said that as we were working with low numbers he wanted to take no chances whatsoever and we’d schedule a day two transfer. SO today … We went in bright and early for an update and our transfer. We met our dr at the door of the surgical suite and he had the biggest smile! 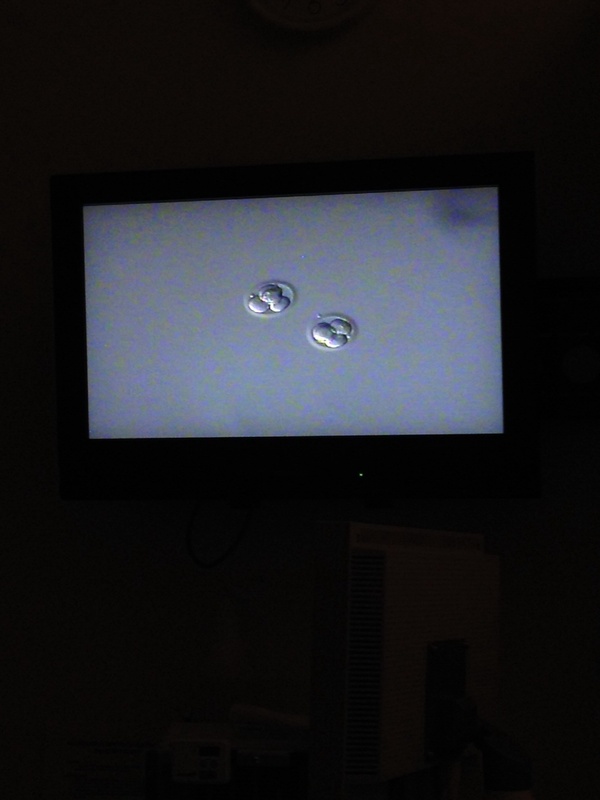 Told us we had two “beautiful embryos” to transfer! I was SO chuffed I even forgot to be in pain from my full bladder! We got into the transfer room got comfy and the embryologist came through to discuss our grades. She LOL’d and said she would but she NEVER gives them out! Both are now back home now and that’s hopefully where they’ll decide to stay. My beta test is due on the 15th September. That’s AGES away! Welcome home! You’ve been dreamed about for a long time. It’s beyond my comprehension that this might work. That this could work. That this time I may very well end up filling my empty arms! I kinda wish I’d taken note of how I was feeling last cycle to compare to this one … So in the interest of future reference that’s what I’ll do now! TMI alert! I feel SO constipated (although I don’t think that I am at all!) maybe that’s the “full” feeling starting to take shape? Although I’d have thought it was a bit early?! I feel ANGRY !!! My poor mr me is a saint! However! If I don’t stab him in the eye with a steaming red hot poker it’ll be a major miracle! I think I’ll have to find him chores to keep him out of harms way for a bit! Queue extensive “Honey Do” list! I’m a teeny tiny bit red round the injection sites but actually less than last time I thinks? I’m piiiiissed off that I am the worlds worst organised OCD person ever! I decided this morning that i’d like to stay overnight in Victoria so I’m not up at the crack of sparrows for a two and a half hour drive down … So I task mr me with seeking a room … Nope! No room at any inn! It’s obviously super busy with tourists this weekend! So I’ll be shooting myself in the belly in a layby on the way down. Ho hum! I’ll know to plan my spontaneity next time!